The Axus Digital AXS2 is a digital piano that’s great for beginners and experienced players alike. With a full range keyboard of 88-keys, which are also weighted with hammer action, this is a digital piano that replicates the sound and feeling of an acoustic. One of the common issues with a digital piano is producing an authentic piano sound. Many do it to great effect, but these tend to be in the high-end price range, but this isn’t the case with AXS2. Instead, you have high-quality piano sound that makes for quite the upgrade over many digital pianos. Better still, as an 88-key digital piano, the AXS2 feels as real as it gets, especially given the graded hammer action. This feature better replicates the touch and feel of an acoustic piano, allowing players to produce a full range of expression and dynamic contracts. As the keys respond to how hard or soft you press them, it’s a fantastic learning tool for beginners, allowing them to better understand the nuances of playing on an acoustic. Furthermore, the range of digital features on the AXS2 rounds out an already impressive digital keyboard for novice players. However, advanced players will also appreciate the AXS2. As it feels and sounds very close to an acoustic, it can be great for practicing at home on a more affordable piano, allowing players to strengthen their techniques. With other features such as reverb included, it’s possible to recreate a live playing environment from the comfort of home. Some players may struggle to perfectly recreate the sound of a classic piece, but the sound remains great, especially compared to similarly priced digital pianos. Being a digital piano, it makes sense that the AXS2 has a trove of cool features that increase its functionality. For example, there are 559 voices built into the AXS2, which is certainly impressive and allows players to create a wide range of sounds as they play. With electric pianos, brass, strings, guitars and most other typical voices included, there are endless ways to get creative should you get tired of the acoustic piano sound. The dual function mode also means you can play two voices simultaneously, letting players combine an endless array of sounds using the 559 voices. Furthermore, there is a total of 203 accompaniment styles included with the AXS2. This allows players to perform with an entire band just with their left hand playing chords, and there are even synch start/stop, intros/ending, and fill-in options when playing with accompaniments. When combined with the huge selection of voices, it’s possible to get lost for hours creating your own unique sounds on the AXS2. Even better, you can use the record functions to record and playback your performances! The split function is certainly noteworthy too and has a few applications. It works by splitting the keyboard into two sections, allowing different voices to be used at once on the keyboard. For instance, you can have a piano at one half and strings on the other half of the keyboard. This is just a single example, as you can combine any two voices with the split function, and when adding an accompaniment, it’s possible to play a three-piece band on a single keyboard. Less experienced players can still have fun with this mode too, as it’ s a great way for tutors to play along with a student, which is why models such as the AXS2 are very popular with schools and piano tutors. Also, it’s quite lightweight so should be easy enough to take from home to school and lessons – professional players may even prefer taking it to their live performances! The Axus Digital AXS2 is a brilliant digital piano for a wide scope of piano players. Brilliantly capturing the balance between an acoustic piano and a keyboard, it comes with quality sound and a host of sounds and voices that make for endless hours of entertainment. 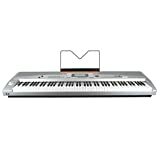 In this price range, you will struggle to find a more versatile digital piano than the AXS2. Whether for a beginner that’s serious about learning or an experienced player looking for a nice digital piano upgrade, the AXS2 is highly recommened.